Published: Aug. 24, 2014 at 12:52 p.m. 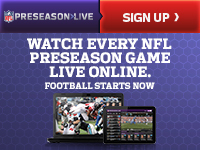 Updated: Aug. 27, 2014 at 06:58 a.m.
Sunday's two-game preseason slate offers fans a peek at three of last year's playoff teams -- the 49ers, Chargers and Bengals -- and a fourth in the Cardinals, which missed out on the party despite winning 10 games. 1. Peyton Manning, Brock Osweiller and Zac Dysert combined to go 30-of-38 passing for 270 yards and three scores against San Francisco's defense last week. With All-Pro inside linebacker NaVorro Bowman shelved after reconstructive knee surgery and nose tackle Glenn Dorsey lost for now to a torn biceps, this year's 49ers lack the talent and depth of last year's squad. We still see Vic Fangio as a top coordinator, but this unit is a candidate to fall from the top five for the first time ever under Jim Harbaugh. 2. We'll be watching how the 49ers respond against a frisky Chargers offense led by the revived Philip Rivers, who new Bolts play-caller Frank Reich called "one of the smartest football guys in the NFL, bar none." Keep an eye on the veteran's chemistry with wideout Malcom Floyd. After missing all but two games last season with a neck injury, the 32-year-old pass-catcher was tabbed by beat writers as the "runaway" winner of Chargers camp. 3. I'm still convinced the 49ers will acquire a veteran to backup Colin Kaepernick before Week 1. Christian Ponder makes plenty of sense, especially after what we saw from Blaine Gabbert last week. Harbaugh continues to call the former Jaguars train wreck "that guy" at the No. 2 spot, but Gabbert's 2.4 yards per throw and 17.9 passer rating tell us this reclamation project is dead on arrival. 1. We'd bill this as a revenge epic between Carson Palmer and the Bengals, but neither team will remember the score a month from now. Still, we're looking to see how Cincy's defense handles Arizona's fleet of weapons at wide receiver. Lightning fast rookie John Brown has achieved cult-hero status, but don't overlook second-year target Jaron Brown, who hauled in two passes for 86 yards against the Vikings last week. Bank on it: Somebody named Brown will play well. 2. Expect a bigger dose of Jeremy Hill. Bengals play-caller Hue Jackson told reporters this week that the second-round running back is "worthy" of first-team snaps alongside Giovani Bernard. With BenJarvus Green-Ellis nursing a hip injury, look for Hill to see early action. 3. With Darnell Dockett out for the year with a torn ACL, the Cardinals' defense is set up for a potential free fall. NFL Media research points out that Arizona last season allowed 3.4 yards per carry with Dockett on the field against a whopping 4.5 without him. We'll be watching to see how journeyman Frostee Rucker and rookie Kareem Martin fare at Dockett's vacated left end spot. The "Around the League Podcast" Fantasy Football Extravaganza has landed. Tell your friends and lovers.